3 Arrival Waves? (2022, 2024, 2026) + Bring Your Pets? Isaiah 17 - Summer War? Why Does Israel Let Us In? Since the earliest editions of Know the Future, the next expected event in Bible prophecy has been the M.E. Nuclear War. This is the conflict by which Damascus shall finally have “ceased to be a city and become a ruinous heap” (Isaiah 17:1). From what Isaiah and Psalm 83 say, Israel is attacked (for a fourth time since 1948) by an overwhelming coalition of Arab neighbor nations. Israel responds to this existential threat by using nuclear weapons, the so-called “Samson Option,” something Israel has threatened in two past conflicts (1973 Yom Kippur and 1990 Gulf War). This scenario explains how Damascus is both destroyed and never rebuilt like it would be after an earthquake. The nuclear fallout prevents resettlement of Damascus like it did for the Chernobyl reactor's worker town of Pripyat. As a result, the world's oldest continuously inhabited city will remain ruins despite being the capital of Syria (at least until the restoration of all things in the Millennium). The question that has always dogged me about this event is when does it happen in relation to the start of 70th week? Clearly, there are events inside the beginning of the 70th week that depend on this war happening first. The chief and most obvious example of this is as our move to a “believer's settlement” in Judea starting in 2024 for safety from WW3/Wormwood in 2026 or the so-called “beginning of sorrows” per Joel 2:32=Matthew 24:16. Non-Jews are not allowed to reside in Israel and it will take the heavy casualties and need for aid in the wake of a war to even temporarily change that longstanding immigration policy. However, whether this war starts inside the 70th week (right after it begins) or some years before that has remained a question. The challenge is that this war is only described in OT prophecies and not in the chronological framework of Revelation. 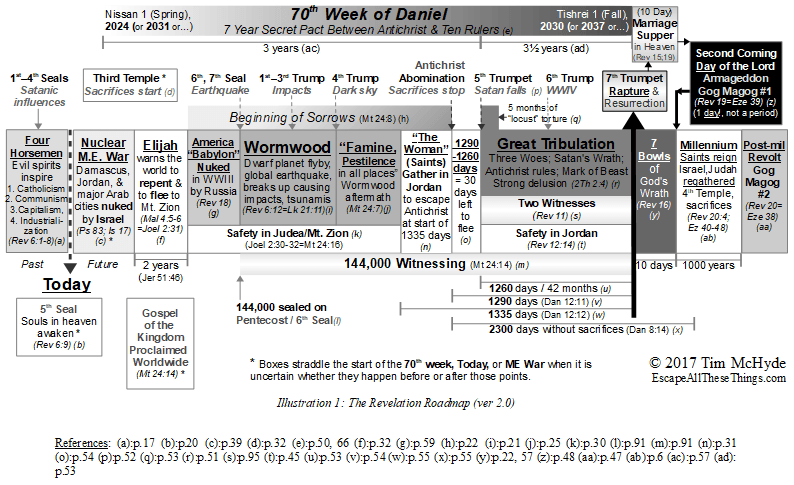 This uncertainty has been reflected on the Revelation Roadmap chart by ambiguously showing the war event (2nd box from left below) as straddling a stretch of the chart before the start and after the start of the 70th week (with a footnote explaining this). If you have not already done so, be sure to read the earlier study on 2026 before proceeding as that will lay the foundation of the 70th week needed to understand the chart above and the article below. To read the rest of this 9,000(!) word study and understand what my (and Katrina's) dreams are leading me expect in 2022 , please join my support team monthly or even for just one month (no monthly financial commitment required). I appreciate your material support in exchange for helping me to continue to bring forth spiritual support (as Paul taught in 1Co 9:11, 14) for the saints to finally learn God's will and to do it (Lk 8:21=Mt 12:49-50=Mk 3:34-35). If you cannot afford to join the Support Team at this time, I understand. Please enjoy the hundreds of other free studies on this site instead! I wonder how much certain topics are coincidences or if I just have my antennas up. I enjoyed this article. There is also the flip side of the coin with grace and forgiveness and judgement. But I haven’t checked out the Handling Verbal Article. Ecclesiastes 7:21-22 is one of my favorite passages. Faith and complaining are inseparable in those stories. Do not believe that lie, friend. Igor……You are NOT the antichrist. You are not the antichrist – you’re just a very naughty boy. Great article. I apparently missed the clue about keeping track of my complaining responses and attitudes from fellowship last Sunday so I’ll plan on doing this for the next week. I’m sure it will be rather humbling to review a weeks worth of this behaviour but should help to provide some perspective and identify triggers. Thanks for the ongoing help and support as we learn to live Gods way. The danger of complaining lies with feeling justified for doing so. And that justification can stem from pride, wondering why certain injustices or troubles have befallen our family. Most of us can relate to the “why me” or “why is this happening to us” dialogue as if we shouldn’t have to experience trials & tribulations. Tim, I think you are spot on presenting this information as life-saving prep work for the conditions we will have to face. Katrina I started listening to your podcast but will have to finish it later when my house is quiet. But I do thank you sincerely for being honest in your struggles with complaining. This is an area that I am struggling with and it’s always encouraging to know how others are successfully pruning their spiritual branches. Your article has definitely heightened the sense of urgency for getting my attitude in check for what lies ahead. I’d rather go through the discipline now rather than have God make an example out of me because I have not exercised self-control. Thank you again for your work! Well, this is extremely interesting. Yesterday I was talking with my 9 year old son about EXACTLY this point and the scriptures you shared. Last week I also considered keeping a notepad for how often my wife and I showed appreciated and gratitude and how often we complained and criticized. I am not a warm and fuzzy person, I very seldom say that “it’s a sign” (remind me to tell you a joke about that) but I don’t believe what you wrote to be a co-incident, perhaps this is confirmation for both of our families about where we need to be – conformation post fact for you guys 🙂. Very, very timely Tim. Also you mentioned Ananias and Sephira- funny enough I think about them all the time. My wife and I discussed this this morning talking about how when we are called to give and set up the kibbutz we can store anything up for ourselves (like women’s products, deodorant, anything personal because we can prepare just for ourselves – every thing we have will be for the body. There will be a double issue there – what is ours is no longer ours and those that have not prepared need to be shown grace and not reluctant giving even if they were late to the party and contributed nothing (just like the scripture about the workers in the field in a way were the workers that came early complained about “fairness” with those coming at the end getting the same pay – it’s a similar “justice” issue that we as humans have a problem with. I could talk on and on about the scriptures and ideas and revelations my wife and I are having and had all surrounding your teaching. Great stuff Tim, it is helping to increase my faith we are in the right path and that we believe we are in the right place to support you as unto the lord. Exciting times. I pray God continues to speak to you, me and everyone involved clearly like this. I just read the supporter content with regards to your planned move to Israel to prepare the way for the people. I had to write to you because I could not contain the emotion I have in my heart. It is filled with happiness right now and excitement, but also a lot of anxiety only in the sense where I am anxious about not being able to prepare everything I have set in my heart to do for that time (and I will tell you about it in a bit), but I just need to trust in Father to help us in all of this. Need to learn to trust more! On my end, I started reading your content and studying the Bible when I was a stay at home mom 9-10 years ago. When my little one (third) came to school age, I went back to work and I wasn’t able to dedicate “full time” as before. But recently, my family moved away from the big city (Toronto) to a very small town about 2 hours out. Previously, my husband wasn’t a believer. (And I owe so much of what you taught, Tim, about kindness, instead of forcing him to believe when I first started out.) Last year he started to become convinced of the truth of God’s word and we started praying together and studying the Bible together (also with the children). We felt that we were being led by Father to move out of the distractions of the world and be in a place where it was hard for our friends to reach us and hard for us to go anywhere because now we’re just in the middle of farmlands. We started (trying) to do Sabbath the best way we can (my desire since forever but only recently husband willing to do so, and I can’t even believe the blessedness of this, how finally we are able to do this as a family, although super far from perfect.) Our family also stopped eating pork and shellfish and other unclean foods since we moved here (almost 2 years now!) despite my husband being a chef. Doing this not for traditional reasons but because we realized really why Father is giving us these things, not prevent us from doing things but to protect us, to keep us healthier and well. We both just left our jobs early this year to work on a business, with the goal of saving up money to pay all our debts (the jobs aren’t working, and we realized, for 6 years it wouldn’t be enough) for ourselves and, most especially, because Father had placed in my heart to help people to move to Israel when the time comes, we were planning to earn enough money so that we could move our families and others, anyone else who didn’t have funds enough to do so, whoever it may be. I don’t know that this is going to go as planned but we need your help in praying for us as well, that we do not lose our way and continue as planned. Another thing is, I would like to pray about this, because as soon as I read your content about 2022, I just had the overwhelming desire to go and help you out. I don’t know how my husband will feel about this yet, but please do let me know if you might need any help when the time comes for you to be there. My husband is super hardworking and hands on, with anything you give him in terms of work. He is also very handy around the house. For years now I had been praying for what Father’s purpose is for my life, and I didn’t know what it was exactly but I know He had placed in my heart to want to help. I just didn’t know how I could help people until the time when He placed in my heart that I could help with the move. I’m writing this to let you know, if you need help with anything by 2022 or 2023, please reach out to me, would be very happy to help. Thank you very much for all your writings and for being such a blessing to our family. I love you both very much and thank Father for you. Kristine, I enjoyed your post! Just like you, I have had a belief in my heart that Tim and Katrina will have a big part to play in the end time Exodus; now that Tim has shared his dreams and insights about 2022, I realise the feelings I had in my heart, were true! How exciting! But I also feel anxious, because my only child, has lost her faith and believe in God (she was brought up with the faith). She and her husband (he instigated it) and their children, go through life without God at this stage and I am so very sad about it! I can only keep praying that in Gods time, and if its His will, He will remove the veil from their eyes and that hopefully in 6 years, they will be back under His wings! Linda my oldest child is like yours – she lost her faith. It’s very sad, isn’t it? We are not the only parents going through this – apostasy is taking many people away. It’s hard to know that our children are going through life without God, isn’t it? I know what I am supposed to do – pray – but it’s painful to even think about my child being so unrepentant and rebellious towards God. It’s hard to pray about this matter. Thanks for your post because you encouraged me; I’m reminded that I should persist in prayer for her to be reconciled to God. I so wish you could be here right now so I could hug you and draw strength from another mother who is so worried and sad about her child going through life without God! I am so grateful that my words could encourage you in this; Tim and Katrina has helped me with the issue over the past 2 years; email them, they will help you! Yes, you and I and the minister and who ever cannot get our children back to God; only He calls people in His time. So if they are called, they will hear His voice in His time, His way; not ours. I often cry my heart out in prayer about this; and always feels better afterwards. Remember Nanette, somewhere in Psalms, God says that He catches our tears in a bottle, keeping it in heaven. How amazing is that; our DNA shed in sadness and despair, is kept close to Him. Lets pray for each other! I found this to be a very encouraging article! I laughed a little when reading the intro as it posed the question “will you be able to bring your pets?” because I’ve actually wondered that quite often but have been too timid to ask, so other people must think like me as well 😀 Did you address this by including scriptural quote “Why, now, have you brought us up from Egypt, to kill us and our children and our livestock with thirst? ” So to clarify, for all the fur parents, will we be able to bring our pets? Tim & Katrina, I thank you so much for this. Truthfully, I have never heard or been in contact with this teaching before you started the Podcasts. It’s totally new to me, at times I have been shocked by the things you have said. One of the economic modeling systems I follow is suggesting a convergence of the war and the economic cycles during the time of 2022 (in this very area) so you may be right about the timing (Tim). As for setting up one or more farming communities that will support “millions” of people who arrive in Israel around 2024 I can say (unfortunately) that I have no answers for you on that topic…The task(s) of acquiring land, resources, knowledge, and the right human structures (collective ones tend not to work out very well historically) along with setting up the means of production to support such a vast number of people in around 2 years is a daunting endeavor to say the least . In any case ‘something’ will have to profoundly change to allow for a mission such as this to be successful–What that is I have no idea…So yes, I am sitting here completely beside myself on this one. Zachary, I had the same thought. Such an enormous resettlement is hard to imagine. However it’s fun to try to imagine it, right? 🙂 I’m envisioning a social structure that imitates Jethro’s system: “look for able men from all the people, men who fear God, who are trustworthy and hate a bribe, and place such men over the people as chiefs of thousands, of hundreds, of fifties, and of tens.” Under such a system, people would organize themselves, settle disputes, and co-operate (or not co-operate) — however their own “hundred” clans are inclined to do. You have to know, I have an ethnically diverse extended family and so I have a heightened awareness of how the communal lifestyle that Asians (and others) enjoy is completely different to the individualistic lifestyle of Westerners. People will need to organize themselves. As for the land, physical resources, and means of support, I have no worries at all. Our Heavenly Father will provide it all. I do think, though, that there is a reason that God has been pushing me to give up my worldly possessions –gulp– I need to let go of my expectations and superficial attachments. It’s easier not to complain when I do that. Hello Nanette, Zachary and all. Regarding the scale of the kibbutz/camp and what is needed to sustain it, my immediate thought was that Yahweh will provide like He did during the Exodus. We’ll have basic equipment like the Israelites took with them from Egypt but the water, meat, protection, blessings will come from God. He will provide. I listen to and support several groups and many of them are starting to talk about the wilderness experience and how kibbutzs will be utilized. I love camping but this will be tough…..part of the testing and refining. Thanks Tim for these insights. I see the Holy Spirit at work, spreading the same message to many groups……prepare, get to work, change is coming, etc. Time to begin to let go of our lives and become what He called us to be. So, I’m confused…if the conflict starts in the next 7 year Cycle for the Lord to return on the next approaching High Sabbath (2026?) when exactly does the Damascus nuclear exchange happen? Are you saying to expect this in the year 2022? I wasn’t clear on that from the article. Either way if it doesn’t happen in the next cycle, we should be looking for these events to transpire within the 7 year Sabbath cycle, is this correct, with the next one being 2032-33? Mauricio, did you read the 2026 article already? I kind of expected readers to have already read that one. Let me know if you did not and then if it helps with your question tell me I’ll know I need to tell readers to read that first. Tim and Katrina, I doubt that many of us have seriously and scripturally considered the consequences of complaining. I certainly hadn’t until reading and listening to your work. The cliche “once you see it you can’t unsee it” seems to fit here. Even if things get the better of you or you try to ignore your grumbling thoughts and actions, you’ll know you’re doing it. Not complaining: now there’s a challenging project! Tim, why Judea for the evacuation and not Petra? The Bible says that after the antichrist appears /abomination of desolation in the Temple, those in Judea should flee for their safety. Would evacuated Christians be caught in this scenario also? Margaret, because Joel 2:30-32=Rev 6:12 tells us the protection for God’s servants is in Judea/Mt.Zion/Jerusalem which is who Jesus refers to when he says “those in Judea.” It’s those God has gathered there from Wormwood before sending them to Jordan (not just Petra) for protection from Antichrist. I see, God’s words has to stand if it is written in scripture. The night after I read your article about Wormwood, I went to bed and just before I woke the next morning I heard a voice saying that WORMWOOD WILL COME IN 2028. My dreams and premonition have always held true and this was so plain. Does this coincide with any of your time lines? I believe it does. Margaret, 2028 would be one year into the Great Tribulation if 2024-2030 is the sabbath year cycle of the 70th week. 2026 is the year that fits Wormwood for that cycle. Tim, but from what you have deduced, 31-37 could be the Sabbath year of Jesus’return which could mean 2028 is wormwood with the tribulation and Antichrist taking up rule shortly after. Or as one person noted the years could be off by a few years and as you suggested maybe by a year approx. Or how would 2028 fit into the Trinulation days and the Sabbath year? I found this article to be one of the most relevant to me that I have read lately. For many years I was enjoying a good life- I had a loving wife, a great job and a wonderful place to live. But the last three years have been a trial, I lost my job (that I had appreciated immensely) and have been unable to find anything. Luckily my wife has been able to pick up the slack but it has been a strain on our relationship. But I am realizing that my problem isn’t not having a job, it’s my lack of faith and my negative attitude. I am a complainer and due to my family upbringing that was what was considered normal. I see now that this has gotten in the way of finding work, after all, who wants to work with someone who is always pointing out the faults in the system? That is what I need to overcome. I see my problem…I feel like I know what I now need to do. As a newcomer here, forgive me if this point has already been discussed and answered. If the ME war takes place in the summer of 2022 the the nuclear bombing of the major Muslim cities such as Damascus, will probably cause high numbers of civilian casualties. Many of these will have relatives and friends who have emigrated to the West. As a consequence massive uprisings in the West among immigrant populations especially in countries such as Germany, France and the UK can realistically expected. This will probably be expressed in more random bombings on the general populations and other indefensible targets,which could lead to civil breakdown of law and order. I’m not trying to frighten people but its necessary that we are aware of probable consequences of this war which will stretch far beyond the Middle East and we should be prepared in advance. Also at the time in the fall of 2022 when workers are going out to construct the camp there could well be large numbers of Jews fleeing back to Israel, from all over the world from the rampant anti semitism which will no doubt ensue from both East and West countries. With Israel having to build large settlements to house the returning Jews maybe the Lord has plans for them to build our settlement at the same time ! Just my own personal thoughts. Your articles and podcasts are very uplifting, and I’ve found myself to have so much better understanding of the prophets now that I’ve read your book and your articles for the past few years. I hope one day to join your family in the kibbutz and contribute where we are able. Abba has given us a nack for homesteading as my husband does all the structure and fence building and I raise the animals. So naturally I was thrilled when I read about Katrina’s dream of the possible kibbutz property. My question for you is what you take from Zechariah 10:8-12 and Micah 7:11-15. Are these passages parallel? I can see Gilead fitting, Will the “safe place” extend as far north as Lebanon? I’m just trying to figure out how these passages fit and they seem to be before the millenial reign by the language used but I’m not sure. I realy liked the idea of the Kibbutz to stay while waiting. It was so logical to me. I’m just wondering , my husband and I are already of age, we are 69 and 64 and healthy , but in 2022 we are 73 and 68. What can we do to contribute to the community in the Kibbutz? That worries me. I will be retired than and I donot think that we will be able to do hard labor on the land. Hi Marcelle, where did you get the idea that God is only going to save people who can be productive on a farm? I’m only a Bible teacher with zero skills for kibbutz life like you. God saves those who are willing, not those who are useful! What Tim said and I fully expect miracles and healings to be normal to have again. I believe the weak and elderly will be given strength like Moses and Caleb received from God. Hello Tim, since you have published this article I must have read it at least five times. I also went to Wikipedia to see what they say about the kibbutzum origin and development. What I found interesting is, as at 2010 there was about 270 kibbutzim with an estimated population of 100000 people. So if you devide 100000 by 270 it gives you an average of 370 people per kibbutz. Let’s say for instance the biggest is between 1000 to 2000 people, and after the ME war, it is sort of desolated and ready for occupation by new settlers, there should be enough infrastructure left over and available for the first wave of believers by 2022 to occupy and start the planning, repairs and maintenance of the facilities in preparation for the next wave of settlers. In the 1st group there should be people who will have either skilled or basic knowledge of building, electrical, plumbing, farming etc. to get things going and get the basics in place for further development as more people arrive and get utilized in different areas to carry on preparing. We need to keep in mind that it is only short term, say 4 to 5 years max, so no serious development will be carried out if it is going to be destroyed again in the next conflict against Satan and his cronies. So what I am trying to say is people should not be concerned about the qualifications they have at the moment, people will be utilized for what ever they are needed for to keep the ball rolling. I am busy making a list of equipment and skills that will be needed to get a project like this of the ground, and will send it through once its ready, for supporters to comment on and make suggestions. I find it exiting on how we will be used to get this project going, we might be in for some real surprises. You are right! Thank you. I’m so excited! I’m just worried about how to create a plumbing system; and food logistics. We’ll either have to grow our own herbs/spices or stockpile them. Whatever we can grow, we won’t stockpile. Regarding accommodations, I hope it won’t be every man for himself. I am sure I will be 100% self-sufficient, but not everyone will have financial ability to do so. The more prepared/fortunate will supplant the lesser ones. I think people forget, myself included, about some of the verses in the Old Testament about God giving people skill and wisdom. Although I think working toward future events is an act of faith. What about families like mine who have young children? Do you think we will be able to go in 2022 or need to wait a little longer? Would there be schools in a kibbutz or would we have to send our children off the kibbutz to school or would we homeschool them? I see Israel is a homeschool friendly country but there aren’t very many families there who do. I am good with children so I could totally see myself in a childcare position. It will certainly be interesting to see what happens and how everything runs. I pray He does cause we really want to go early if we can. My husband and I think this is all pretty exciting, I asked him what we are going to do when the call comes and his comment was we get in his Toyota Ldv and travel overland from JHB to Cairo and from there get to Israel. My comment was what will we use for fuel and he said Diesel as it is all the way up Africa for Trucks to use. As to being too old we know that if YHVH GOD kept the Israelites in the desert He will keep us as our hearts are really in this. Even though we have just moved house we feel that it is not the end for us, so we will keep moving. We have moved 12 times in 48 years so Israel will the 13th move. Wow! Is this a dream? What an exciting time to live in! Tim is the Joseph of our time in as much as the Lord has revealed all these things to him. May the Lord bless and keep him as we await further instructions. Am eternally grateful. Obiajulu. Hello Tim and Katrina, hope you are doing well? I have just read an interesting article on Prophecy news Watch regarding a new political party that was formed by Avi Lipkin which is a joint Jewish- Christian party which will partake in the next Knesset elections. The idea is to represent all people who believe in the Bible or Christians which are currently not represented in the Knesset. Read article on the PNW website. Could this new party perhaps pave the way for the 2022 move to Israel? It is very interesting. Hi Tim and Katrina, I have done a lot of thinking about the two dreams Katrina had about the buildings that she has envisioned. To me it shows that at that time there will be more of these homestead’s that will be available to be prepared for the next waves of people that will be arriving. The other thought I had is that I am sure that these places will not be fully desolated but there will be some of the people left, not many, that worked at these various locations who will be able to assist and guide the newcomers in the running of these kibbutzim. So I am sure we will have some guidance once we get there. I’m sorry for the German National team today, they didn’t make it further in the FIFA World Cup 2018 in Russia, and are now out. The boys fought well, but that’s sport. Good game, and thank you to the boys. Thought I mention it. This aside, when I found out that Qatar will be hosting the next FIFA World Cup in Soccer in 2022, that got me both worried and thinking, and I remembered Tim and Katrina’s dreams about 2022. From what we know today, FIFA 2022 in Qatar is set to kick off on 21 November and end on 18 December. Many national teams from all over the World will be there. I thought that struck me is that the Arabs & Iran may choose to orchestrate the events & the following Psalm 83 attack on Israel during the tournament, believing that Israel would not dare retaliate against them, because of them hosting national teams from so many nations, as well as delegations, and hundereds of thousands of fans from all over the world. When Arabs think that they are safe beacuse of hosting the FIFA World Cup, Israel will not care and retaliate against them with nuclear weapons, killing everyone, the national teams/football fans gathered from all over the world. I just wanted to share my thoughts on this here, it’s incredibly scary. Shoud it happen like this, it would sure cause the World to hate Israel & the Arab States alot! Hope I’m wrong, yet however it happens it will still be a very scary and tragic experience, and Israel will be hated on anyway. Interesting thoughts. Thank you for sharing. It definitely seems possible. After reading this article the first question that came to my mind was: Is the “farm” dream referring instead to the “place prepared”? There are many farms (and farmland) in Jordan. I’m just wondering if you’ve considered this to be ‘where’ your dream might be leading you? I bring this up because the entire “Kibbutz” theory that you’ve proposed doesn’t make a lot of sense from the perspective of Israel’s situation. I’m guessing Israel will be relatively desperate, possibly with a fairly large loss of life (30%+), along with loss of arable land (possible radiation), and a destruction of general infrastructure. Kibbutz farms aren’t exactly known for being “efficient” and/or “highly productive”. 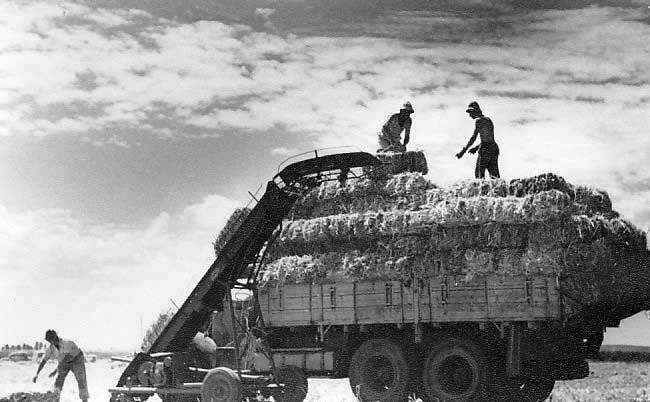 In fact, Kibbutz’s do not base themselves on “agriculture” (as you stated) but instead base themselves on the Marxist ideology that the “male patriarchy” is the cause for humanity’s ills—hence, the ideology was designed to “remove” said patriarchy by “allowing” women to work in the fields—this is then coupled by a sudo-state entity (part of the group) raising the children of these “worker parents” so they can go out and “work the fields”. Marxism views the “natural order” as the problem my friend. In fact, the very hierarchy posed by God (Father) and Son would be opposed by such an ideological worldview. But this poses an additional question: Why would Israel bring in a million people (your estimate) to work limited arable land just so those people could make possibly enough food only for themselves? Remember, Israel did this to incentivize “Jews” to move to Israel from already socialist countries—They did this to increase their numbers. This incentive would no longer apply—as bringing in a large number of non Jews simply to breed and take up space would not provide any immediate benefit to Israel (from what I can see). Unless this provides a benefit to Israel I don’t see how that could even take place—However, I do see the other possibility (that you mentioned on one of your older articles taking place)—Israel letting in people to fill a multitude of job roles and positions all of which could be living in various areas throughout the country (even in farm camps). This to me seems like the most logical conclusion but that’s just my opinion. Could I see “something else” (or similar) taking shape in the “place prepared”? Yes, I could. But in no way would it be based on the same ideology as that of Marxism (which, by the way is a horrible way to view the world because it completely denies human nature and that of limited resources). I’m guessing you didn’t intend this specifically (also guessing) but it’s important to note the true purposes of these “kibbutz’s”. IF the “place prepared” has food/water provided by God directly then people could spend their times doing other things—heck, God could even clear out that entire area into space to allow normal sunlight (and therefore normal conditions for farming, etc. would be possible). Tim, I’m not a financial supporter, for the simple fact that I’m unemployed and survive on French unemployment benefit. I did, however, purchase “Know the future” several years ago and consider the information given vital for our times. I would very much like to continue reading your articles and catching up on truth. Tim, I’ve been tithing for some time and have a few of your books. I’ve given all my relatives a copy and have a few left, but I don’t think anyone has read the book. I would like to see if I meet the criteria for a membership. If I do would you please send me a password. Thank you always, your friend, bob wheeler. Bob, I tried giving you access last year so I’m glad you are now interested. Sent the invite again by email. Bless you. Wow, I’m really glad I read this because I didn’t realize that preparing for a move to Israel was a preparation for Jordan. I’m on it in prayer for God’s alignment and I can’t thank you enough for being a Moses to us. I pray God’s abundant blessings for each step of your progress, with more than enough provided for you and your family. Remember that God grants desires so I am believing your kitties go with you. I read a few other things on your site today and I’m overjoyed that you now have a car in Germany. God is so faithful, isn’t He? Always bringing us to new seasons and levels of blessings. You’re an incredible blessing to the Body of Christ. Your rewards are great. Bless you and family always. I am praying for you all. I rejoice to know that Zach is moving toward his total healing. These are all tremendous dreams God has given and I rejoice with you in God’s great unfolding.